While having access to your fertility symptoms online from any computer is convenient, many users would still prefer to have a backup copy of their data on their computer. This enables them to access their data offline and archive copies of it. My Fertility Charts works with the Hormonal Forecaster to support this. 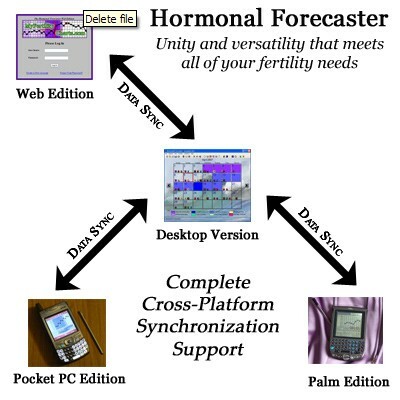 By running the Web Edition Synchronization utility included with the Hormonal Forecaster desktop software (version 5.2 or later), you can upload and download your fertility data, ovulation dates, personal recorded events, and more. This permits users to manage their fertility data online and offline while the software helps preserve consistency of records in both locations. This is an optional feature. My Fertility Charts does not require any software to use the site. You can use this site by itself and never have to download or use any software. For more information on synchronization, please select Synchronization from the main menu of your account. 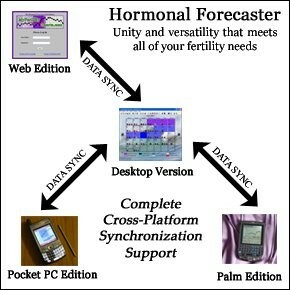 For more information about the Hormonal Forecaster desktop version as a stand alone solution or to complement online fertility charting at My Fertility Charts, you can see the Hormonal Forecaster page on this site.